It's remarkably difficult to find a decent cup of coffee to the west of Salt Lake City. Ok, so maybe I'm spoiled by being able to stop at the Short Stop on my way through New Ipswich every day (or brew my own at home, should I actually have the time and/or brainpower in the morning to do such a thing), but good coffee shops are apparently rather rare around the West Valley City area. So far every cup of coffee I've found in a direct line from my hotel to the office was lacking; mostly flavour. So I kept looking. My preference is, of course, for a small independently owned coffee shop like the Short Stop. I looked and I cannot find one there. I will admit that I avoided the truck stop coffee strictly on principal as I still have taste buds that function. 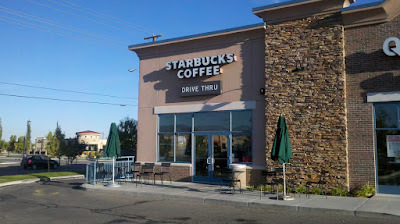 In the end I found a Starbucks in West Valley City on 5600 Street. It's actually quite out of the way for my morning commute, but while Starbucks might not be my first choice in the morning (see above), it is one of my top choices (one of two top choices, anyway) once I cannot find a decent small independent shop. I've come to know a few of the staff members there and they happily give me a medium coffee in a large cup and they never complain that I refuse to use Starbucks size lingo, especially at 5:00 in the morning. A cup of coffee with cream only, the reason for the medium coffee in the large cup, and a scone and I'm on my way to work. Might be a bit of a small breakfast, but it's good, the coffee is strong, and it makes the morning all that much better. At this point I don't think I'd really want to find another place to go; it's my morning refuge when I'm out there in Utah and the staff there make it worth the trip. Thanks guys!